may 22, 2000. Fox Plaza stands at Market and Hayes, but it wasn't always there. A magnificent theater once occupied the entire block. This is about one night at San Francisco’s "Cathedral of the Motion Picture." Many called the night historic. For me, it was an opportunity to create magic. In 1960, our homes were being wired for new phenomena called "hi-fi" and "stereophonic sound." Turn a knob and the bass shook the house; the high-pitched sounds, we were told, could shatter glass. We discovered that nothing produced a wide spectrum of sound like the huge pipe organs installed in theaters across the country. And by most standards, the finest organist was George Wright and the best organ installation was in the San Francisco Fox. Together they produced "George Wright's Showtime," still a benchmark for the era’s recorded sound quality. If it sounded so great in my living room, how much better it must sound in the theater. I wanted to find out. And I did. Theater management said $500 and the place was mine. George Wright said $500 and 5,000 of my closest friends could experience the magic. We had a deal and the tickets, priced at $2 each, went on sale. Would anyone buy a ticket to hear a guy play the organ at midnight? A few minutes after 10 p.m. on Saturday, March 5, 1960, the night’s last showing of "Sink The Bismarck" ended. Outside, thousands lined the block around the theater. Yes, people certainly would buy a ticket. In fact, 4,700 came to hear Mr. Wright. Just after midnight, the house lights dimmed and what I will always remember as a defining moment in my life began to unfold. From the organ chambers located to the right, the left and above the stage, came first the sounds of pipes recreating violins tuning up for a concert. Then, 32-foot pipes literally shook the building with the intensity of a decent-sized earthquake. From six floors above and a full city block away, a piercing spotlight hit the orchestra pit, and the sound of Irving Berlin's "There's No Business Like Show Business" punctuated the night air. Slowly and with an awesome majesty George Wright emerged, seated at the magnificent San Francisco Fox Mighty Wurlitzer Theater Pipe Organ. "George Wright's Showtime" had come to life. In the years that followed I saw and experienced the genius of George Wright. Unquestionably one of the finest musicians America has ever produced, he created musical moments which are unforgettable. Wright led an international band of folks with some very off-the-wall interests. Rational folks, many might argue, don't spend nights searching through miles of wires to connect a single pipe to a keyboard to produce sound. Or giving even more hours to assure that pipe played in tune with hundreds of others. The process included a search for music and the goal of replicating a sound which went out of style years before television, fax machines, or the internet. Finally, the product of this accomplishment was, and still is, usually performed in theaters containing less than 20 people. Praise the Lord for the Castro!! I take pride in being part of this very strange group, trying to prevent a sound we love from slipping away. It is a sound which, for so many of us, began when we first heard the sounds of George Wright in the "Fabulous Fox." The San Francisco Fox Theater closed in February 1963. Its replacement, Fox Plaza, exemplifies corporate greed in the 60's. An irony: plaza supporter George Christopher was the last Republican elected mayor of San Francisco. Allen White is a San Francisco writer. 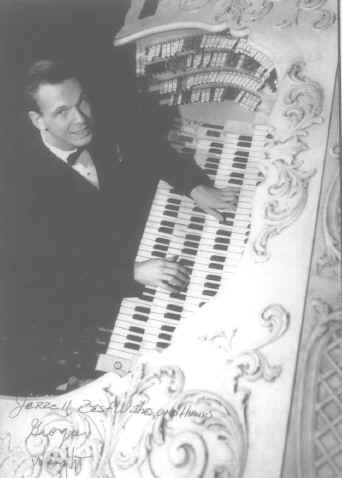 He also produced the first of a series of midnight organ concerts with George Wright at the San Francisco Fox Theater.